Elia beach is a beautiful and very popular beach in Mykonos, ideal when north winds blows, since is protected by the surrounding mountains. It is one of the largest beaches on the island, with shallow waters, fine golden sand and wonderful views at Naxos. Elia is one of the places you can find everything and have all amenities, water sports, bars, restaurants and many accommodations. It’s a quiet beach, peaceful and will surely steal your heart! The International Organization of Beaches and the Blue Flag Organization have reward Elia beach as one of the cleanest beaches in Greece. Access is very easy, by bus or by boat. 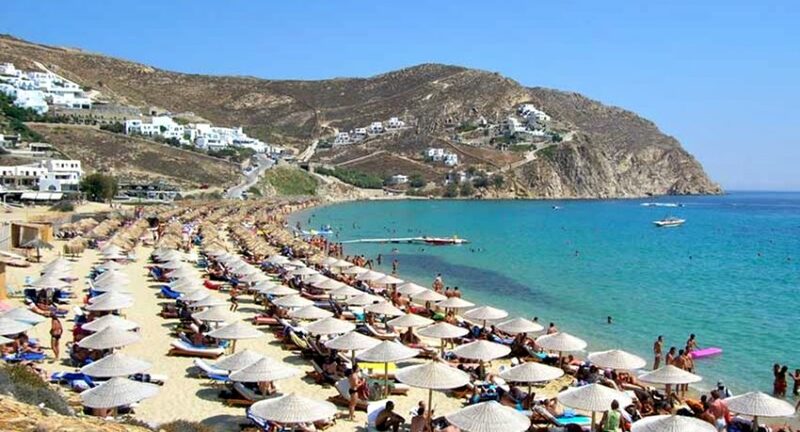 Many people characterize it Gay friendly, as it is also the case for other beaches of Mykonos. Around Elia beach there are large luxury hotels but also family hotels, and this makes the beach very secular. Here you will meet many of the famous visitors of the island. Although it is so crowded, everyone can find a place in such a large beach. It is also suitable for families with young children who love it for the shallow waters and the golden sand. The restaurants and the beach bars in Elia Beach provide impeccable service and many amenities. Here you can enjoy from local Mykonian and Mediterranean cuisine to sushi, which they can serve you even to your sun lounger. Swim in the clear waters and enjoy the convenience of a well-organized beach. Drink your coffee, relax in your deckchair, read your journal and be sure that no one will bother you. If you like sea sports and activities, there are plenty of them which can make you spend your time pleasantly and with a lot of fun. Distance from the town: 10 km.